Finally, some solid details on what we'll see in the handheld fighter. When Mortal Kombat hits the Vita later this year, it will be going head-to-head with both Ultimate Marvel vs Capcom 3 and Street Fighter X Tekken. That's pretty stiff competition for a rehash of a console game that originally debuted in 2011, so developer Netherrealm Studios has taken steps to upgrade the portable iteration of its flagship fighter. Speaking to the official PlayStation Blog, Netherrealm Studios creative director Ed Boon explained that the Vita game will include all of the content from the PlayStation 3 version of the game. All the characters, downloadable content and unlockable extras. More crucially however, the Vita game will also include new stuff. Remember that insanely long Challenge Tower that rewarded you with coins in exchange for completing special objectives during combat? The Vita game will also include a second Challenge Tower. In terms of gameplay, we've always wanted MK to be as accessible as possible. For example, you can touch your X-ray meter to execute an X-ray attack. For fatalities, you can "slash" the screen with the appropriate inputs - say, away, away, up - to execute the fatality. 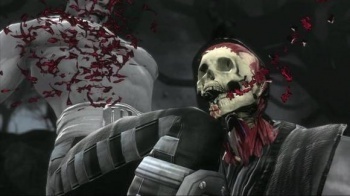 It makes some of the more difficult fatalities easier and it's fun to slash at your screen to fire off a fatality. I was surprised by how engaging it is. Unfortunately, some allowances had to be made owing to the power disparity between the PlayStation 3 and its upcoming portable sibling. Boon says that while they had to reduce "some of the polygon counts from the backgrounds and characters," the game benefits greatly from the Vita's high-resolution screen. "It really maintains the identity of the game," he said. What Boon does not address however, is why fighting game developers would be eager to add touchscreen controls to their games in the first place. Have you guys played the 3DS version of Super Street Fighter IV? Moving your hands off of the handheld's buttons to tap a special move icon is really, really awkward. I get that developers (and Sony especially) want to demonstrate how great the Vita's touchscreen technology is, but until someone can prove otherwise, I'm chalking all touchscreen use in fighting games up to sheer gimmickry. Of course, I've also got horrible impulse control, so they'll still get my money.